Richie Emmerson (tenor, alto, soprano sax); Alan Thompson (tenor, soprano sax); Rick Laughlin (keys, synth); Keith Peberdy (bass); Richard Miles (drums). The second week of the Jazz Festival continued with a tribute to Grover Washington. Soulful and funky and played with great passion and expertise. 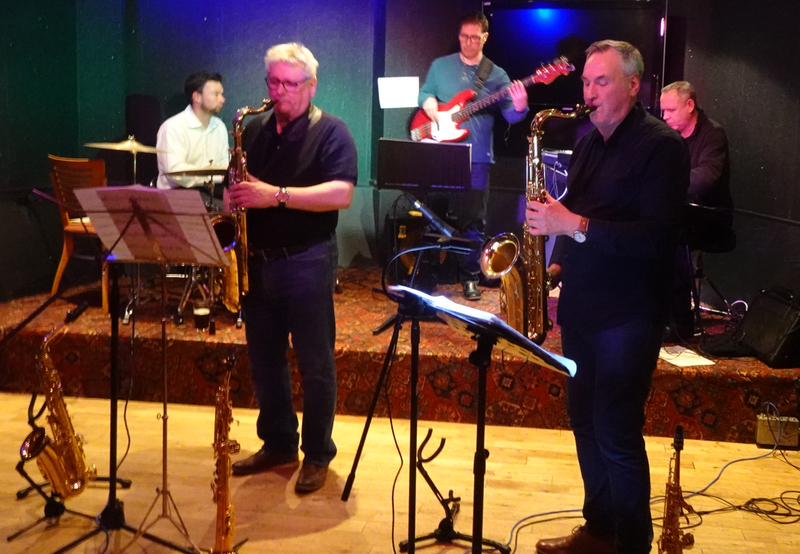 Richie and Alan blew a fine intro on tenors to Do Dat, along with Rick on synthesiser, this was followed by River Drive and a switch to soprano saxes with some lovely interplay and powerful dynamics from the band. Richie stayed on the straight sax and Alan returned to tenor for a beautiful version of the jazz standard Stolen Moments. ‘Moments’ also had an excellent bass solo from Keith. Back to the funk with Let It Flow, using two tenors, a blistering solo from Richie and an amazing blast by Rick on synth. The classic Reed Seed, from the Mr Magic album featured Alan on soprano and a wonderful piano solo from Rick. The first set closed with, again from the Mr Magic album, Black Frost. The second set started with Take Me There, followed by Maracus Beach and Loren’s Dance, before playing the great Winelight, using both tenors, fine piano and effective rhythm from bass and drums. Richie was featured playing alto on the lovely Make Me A Memory, before the penultimate number, Mr Magic, played with great enthusiasm by the band. Not surprisingly, the audience demanded an encore so Easy Loving You, was a great driving number to finish on with a tasty drum solo from Richard and Rick on synth. This was a memorable night and a special treat for a full audience enjoying the funkier side of jazz played by musicians with more than enough feeling and understanding to satisfy even the most discerning of Grover Washington fans. Thanks must go once again to Dormans Club for their help and support making all of this possible.